We specialize in Alzheimer’s and Dementia Home Care Services. Providing compassionate, attentive home health care when it’s most needed! For dementia home care services, Retire-At-Home in Toronto and North York is pleased to offer our clients a specialized program to tend to the specific needs of seniors with Alzheimer’s disease and Dementia. Taking guidance from the Alzheimer Society of Canada, we deliver person-centred care, as well as train our staff at the Alzheimer Society so they can better understand dementia and how it affects loved ones and their behaviour. Our dementia home care provides support and respite to the family caregiver. Specially trained staff for responsive behaviours. Person-centred care for your loved one. What are Responsive Behaviours in dementia home care? Responsive behaviours refer to agitation, walking away, or physical resistance that sometimes appear in the moderate and late stage of dementia, when your loved one’s cognitive ability has declined. Responsive behaviours can be difficult to understand and manage by families and caregivers. At Retire-At-Home Services our Personal Support Workers (PSWs) are trained by the Alzheimer Society of Canada to understand and diffuse these behaviours, helping to calm the situation and enhance our dementia home care services. Why Person-Centered Dementia Home Care? The Alzheimer Society of Canada recommends person-centered care for loved ones with Alzheimer’s and other dementia. In simple terms, instead of ‘mom’ having to conform to the values and practices of a company or nursing home, person-centred care conforms to ‘mom’. This is the basis of Dementia home care. Family involvement to ensure that we are doing the right thing (as you know your loved one best). What is a Dementia Home Care Coach? Do you ever wish you had a highly qualified and experienced expert on dementia home care to step into your family’s world to give you guidance and support? Would you like someone to come and see first-hand what you are dealing with, help you with advice, direct you in your care needs, and suggest how to prepare for the future? Our expert Dementia Home Care Coach can do just that. With years of experience seeing people through the course of dementia, our dementia home care coach can help direct the best care and support for your family and loved one. Our Dementia Home Care assistance can help. Dementia Home Care Services: Why Support the Family Caregiver? Family caregivers are sometimes referred to as the ‘secondary patient’, with the demands of care giving taking its toll on the physical health, mental fatigue, social support, and well-being of the family caregiver. One element of proper support for the family caregiver includes regular times of respite, whether it is two afternoons/evenings a week, or allowing the family caregiver to take an out-of-town trip. Our highly trained PSWs can be a source of reliable care for your loved one while the family caregiver takes time to recuperate and recharge. In addition to providing respite for the family caregiver, we can provide information about programming, activities, and support groups available in the community. We can also educate families about dementia care and person-centred care. We can assist the caregiver in their role by providing information and suggestions as to how family and friends can still enjoy time together. We are trained in Montessori methods for dementia home care. Montessori methods gives us tools to prepare a person’s environment to allow them to live a better life while living with dementia. We also use Mind-Start activities and puzzles that are especially designed to engage and entertain people with dementia. We would like to become your partner with dementia home care. 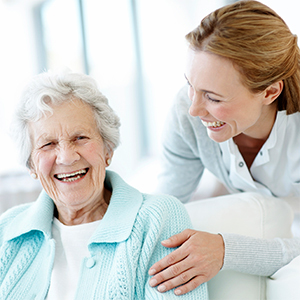 We specialize in caring for people with dementia and Alzheimer’s disease. We can connect you with services and resources from the Toronto community. Watch this short video from renowned Alzheimer’s care expert Teepa Snow on the importance for families to join with a care partner to help with the care of a loved one. Call us to discuss how our Alzheimer’s Care program can help you or your loved one. For more information, please see our Home Care Services and Stages of Alzheimer’s Disease blog post.